PetPlan Pet Insurance is one of the best-known pet insurance companies in America and is a licensee of PetPlan UK, which is the oldest and largest provider of pet health insurance in the world. They offer inclusive plans for low costs, and have top of the line customer service support. 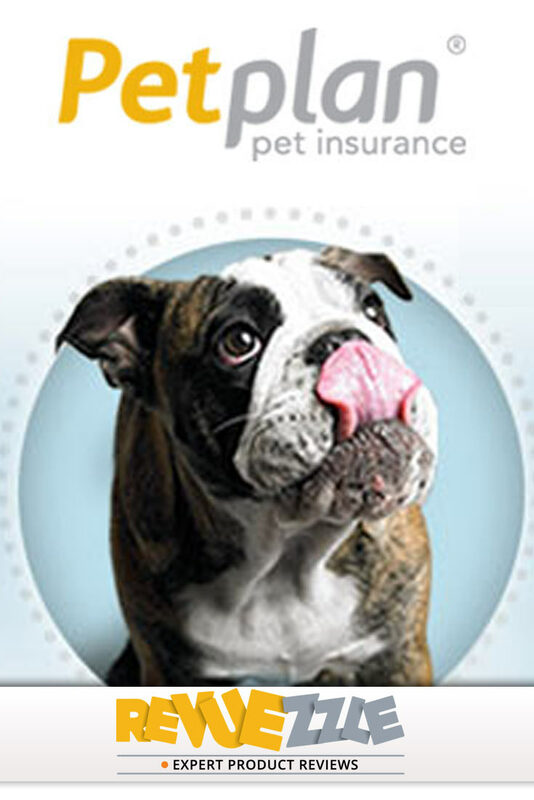 PetPlan is a pet insurance company with a strong brand name and few restrictions. It is ideal for pet owners looking for flexibility and reputation. 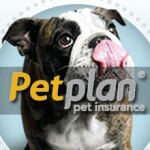 PetPlan Pet Insurance offers plans for cats and dogs. They offer one plan that covers accidents and illness with various levels of deductibles, reimbursement levels, and annual limits. Annual limits start as low as $2,500 and go up to an unlimited annual policy. Deductibles start at $100 and go up in $50 increments to as high as $1,000. Reimbursements are offered for 70%, 80% and 90% – they do not offer a 100% reimbursement so you would be looking at a minimum of at 10% copay. 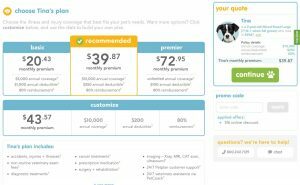 For dogs, monthly premiums range from $20/month to $39/month for small dogs, $20/month to $56/month for medium dogs, and $21/month to $73/month for large dogs. 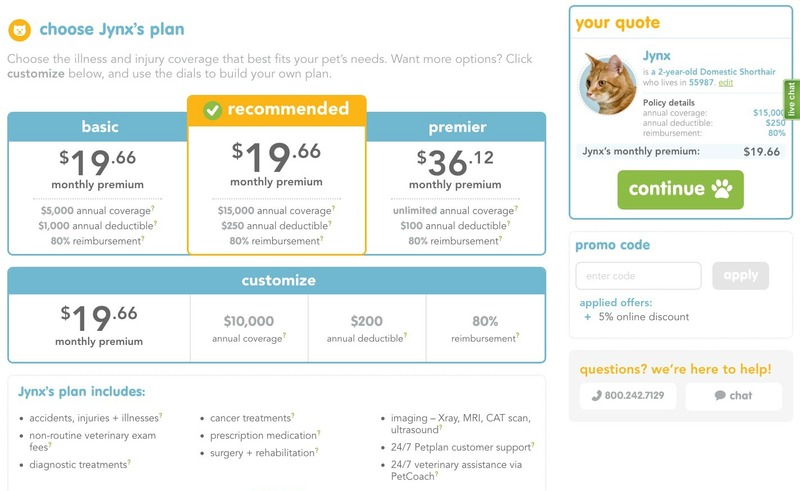 For cats, owners can expect to pay around $20/month to $36/month. Their pricing is a bit higher than #1 Figo but not by much, however they do not offer a multiple pet discount – so if you have multiple pets you won't save with Petplan. Petplan offers a 30 day money back guarantee as long as you don't file a claim. They don't require a pre-enrollment vet exam, or medical records. Medical records would only be requested if your pet is currently taking medication, your pet has had a recent injury or illness, or you are re-enrolling your pet with a Petplan policy after there has been a break in coverage. Upon enrollment there is a 5 day waiting period for accidents/injuries, and a 15 day waiting period for illness. There is also a 6 month waiting period for cruciate and knee problems that can be waived with a vet checkup of the knees and specifically if they are listed in full good health overall. PetPlan insurance is available in all 50 states, as well as in the District of Columbia. This is great for those looking for flexibility when traveling and/or someone who moves a lot as there is no need to purchase new coverage for your pet. In fact, coverage even extends to a few Canadian provinces. Non-curable pre-existing conditions, pregnancy – except complications from, routine wellness, vaccinations, spay/neuter are all excluded with PetPlan. Dental care is also excluded except when it is due to an injury. 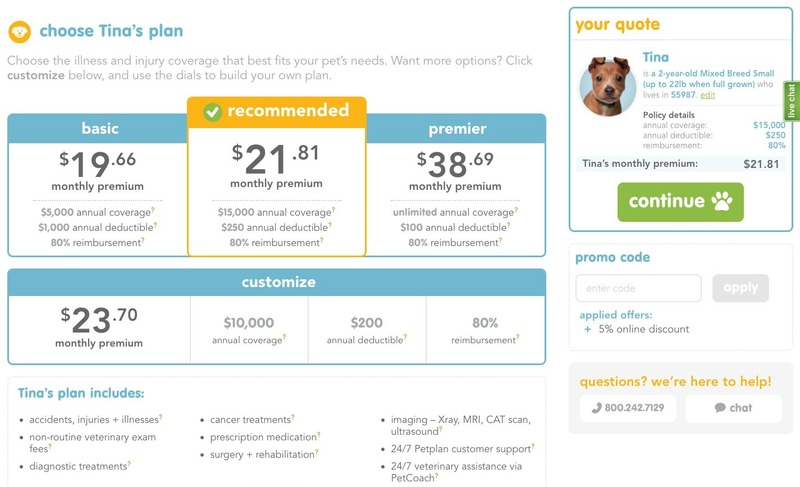 PetPlan gives multiple options for your deductible amount – you can select a deductible from $100 to $1,000(based on $50 increments). You can select a reimbursement level of 70%, 80%, or 90%. They do not offer a 100% reimbursement so you will have a 10% minimum co-pay. Claims can be submitted online, by phone, email, fax or mail. Processing normally takes between 5 and 14 days. You have 90 days from the date of the vet visit to submit the claim. PetPlan has annual limits of $2,500, $5,000, $10,000, $15,000, $20,000, $25,000 or unlimited/no annual limits. These limits are based on yearly renewals, since PetPlan does not have lifetime limits. PetPlan takes great pride in repaying claims as quickly as possible. They guarantee payment within 30 days of receiving a complete claims submission, and often are able to able to reimburse clients in as little as 5-14 days. PetPlan does not offer any extra add-on plans. In their own words, they say that “data shows that routine care coverage can artificially inflate premiums for all policyholders and can represent poor value for the policyholder”. For this reason PetPlan chooses to not offer routine coverage. Enrolling your pet with PetPlan can be done completely online and takes only minutes. All that is required of you is to input your pet’s stats, choose a plan, and then fill in your billing and mailing information. If you prefer you can also call and enroll your pet. Customer service for PetPlan is available 24 hours a day, 7 days a week. 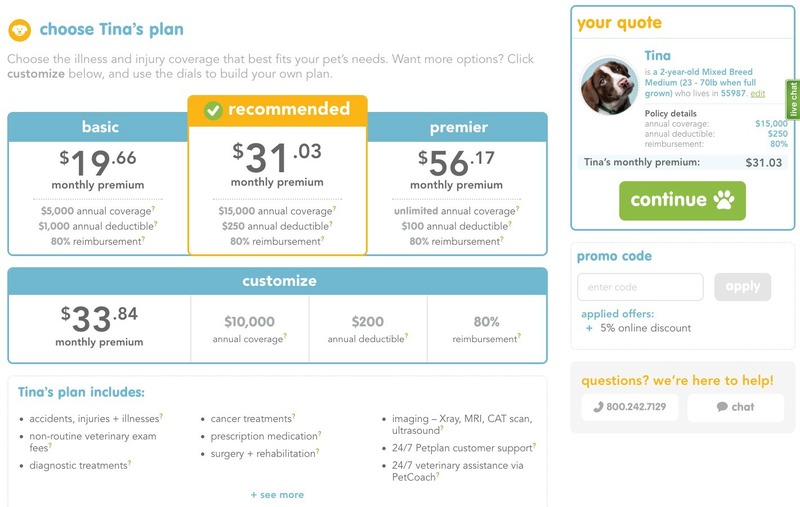 They can be reached toll free at 1-866-467-3875 or e-mailed directly from the contact page on their website http://www.gopetplan.com/contact-us. Not only that, but they also have a live chat option online that allows an employee to immediately answer any questions that you may have. $22.17 – 2 year old Domestic Shorthair cat from Minnesota, unlimited annual limit, $200 deductible, 80% reimbursement. PetPlan will not increase your premiums as a result of filing claims. PetPlan has annual limits of $2,500, $5,000, $10,000, $15,000, $20,000, $25,000 or unlimited/no annual limits. Behavioral therapy and holistic care like acupuncture and chiropractic treatments are included with PetPlan, as is behavioral therapy. Effective Date: Day after purchase. PetPlan is best suited for owners who want pet insurance from a trusted and respected company that offers great customer service and cost-effective plans. PetPlan guarantees reimbursement in a maximum of 30 days, and usually is able to pay back claims within 5 to 14 days of submitting a claim. This is very quick and helps owners get back the money they deserve as fast as possible. Mobile apps make it easy to submit claims and manage your account on the go, so that you and your pet are ready for life’s emergencies. The coverage PetPlan is a comprehensive accident and illness plan, including alternative therapies, behavioral therapy, cancer treatments as well as hereditary and congenital conditions as long as they aren't pre-existing. You can choose to have your deductible be a per policy period deductible or per condition per policy period deductible. If you wish to select the per condition per policy period deductible then you would have to call to enroll. 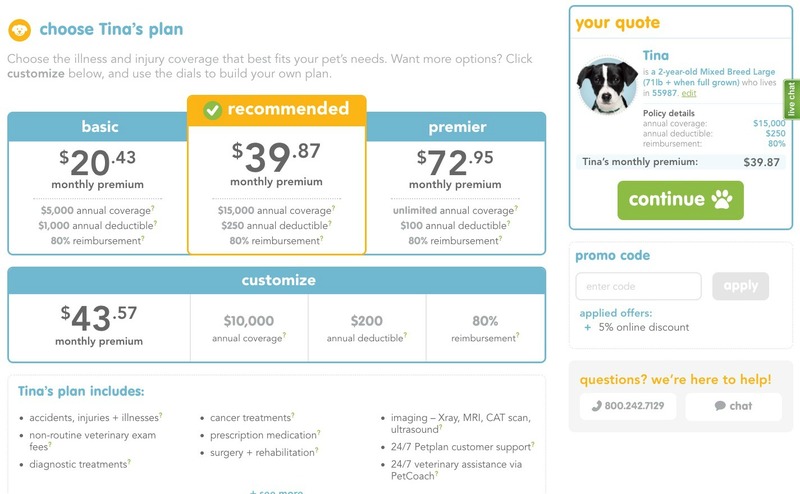 PetPlan charges an extra fee of $2.95 per pet per month, plus a one-time $25 enrollment fee. PetPlan does not offer any sort of wellness add-on that covers routine care. 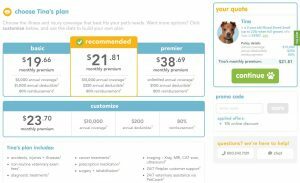 They claim that this is to keep premiums low, yet almost all other pet insurance companies are able to offer optional wellness coverage while maintaining competitive prices. PetPlan does not cover routine dental cleanings. They only cover dental issues arising from trauma or injury. They don't even offer this as an optional add-on. This is not just a knock against PetPlan, as other providers don't offer Spay/Neuter coverage either. However some pet insurers do offer it as a wellness add-on at least. With increasing stress put on shelters due to kittens and puppies from non spayed and neutered animals, it would be nice to see pet insurers step up and cover these procedures. PetPlan offers exceptional coverage with a brand name to back it up. With coverage extending throughout the United States, pets are covered out of state as well as in Canada. 24/7 customer service and mobile apps make accessibility easy. As well, high annual limits, and no lifetime limits, means that customers will never have to worry about exceeding coverage. There are some limits to their coverage however, such as not providing routine wellness care. Even without that though, PetPlan offers some of the best plans in the industry for a low cost, making them one of the top choices for providing pet insurance in the country. PetPlan provides several discounted offers! Pricing varies based on breed, age, geographic location, and the size of your pet. Pricing for cats is not influenced by size, so a typical plan would look like this: $22.17 – 2 year old Domestic Shorthair cat from Minnesota, unlimited annual limit, $200 deductible, 80% reimbursement. $33.00 Get a FREE Quote! Want to insure a pet quick? You can apply and setup your plan online with PetPlan. No calls necessary.